To people just passing through, Ohio can seem like little more than flat farmland and miles of cornfields. Clearly, they haven’t been to the Hocking Hills – an area of amazing natural beauty just over an hour drive south east of Columbus. The area has towering black sandstone cliffs, gorges, caves and waterfalls, with landmarks such as Cedar Falls, Ash Cave, Cantwell Cliffs and Old Man’s Cave. The Hocking Hills area is comprised of four unconnected state parks as well as state nature preserves and forests. One of my favorites areas, especially in the fall is Conkle’s Hollow. The Hocking Hills rewards visitors in all seasons: enjoy the cool of the shady forest footpaths in the summer, gaze at the stunning fall foliage or the discover the spectacular ice-sculpturesque winter waterfalls. The perfect area for a day trip or weekend getaway! This spring I was invited to be a guest at a blogger’s retreat at the Inn at Cedar Falls. 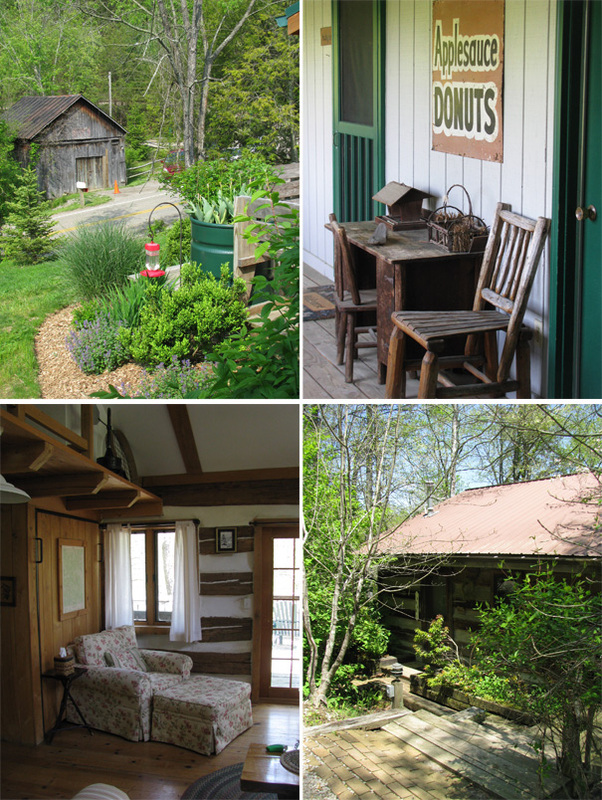 While there is a wide range of accommodations in the Hocking Hills, including camping and cabins, in our estimation the Inn is the place to go for a relaxing getaway. Complete with a full service spa, wood burning stoves and a beautiful garden, you can do as much or as little as you want. If you just want to relax you can enjoy a massage and spend your day lazing in a hammock. 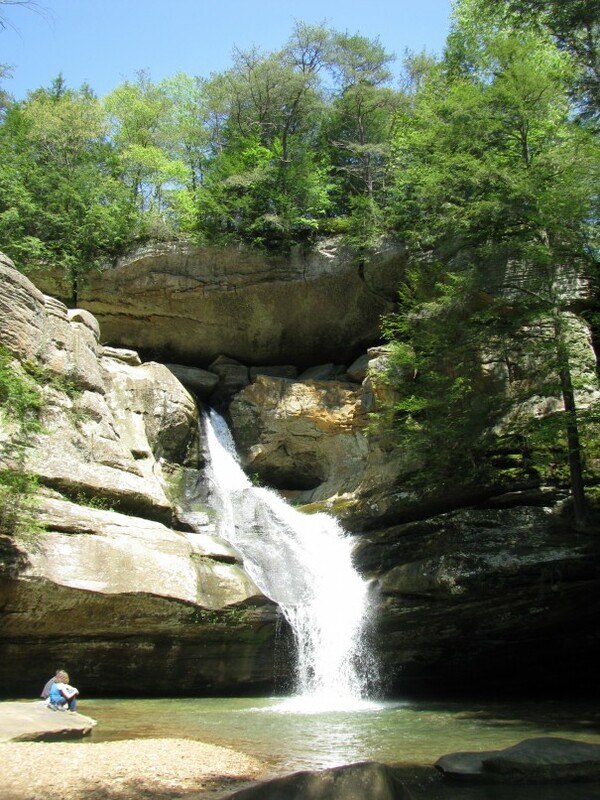 If you’re feeling adventurous the Inn is well placed to explore the Hocking Hills and it’s a short walk to the Cedar Falls themselves (pictured above) or a drive to Hocking Hills Canopy Tour. There are also canoe liveries, stables and ATV adventures or you can rent a bike and explore the Hock Hocking Adena rail to trail bikeway. The Inn offers a range of accommodation including 1800’s log cabins, cosy cottages and rooms in the lodge. We stayed in a cottage and enjoyed watching deer from the porch swing on our private deck. You need not be a guest of the inn to enjoy restaurant and bar. Helmed by Chef Anthony Schulz, there’s a strong emphasis on seasonal menus using as many local ingredients as possible. The Inn has a roof garden that provides some of their herbs and greens (out of reach from the deer), they tend their own bee hives, and Anthony and Innkeeper Terry are avid foragers. We were lucky enough to be there during morel season. 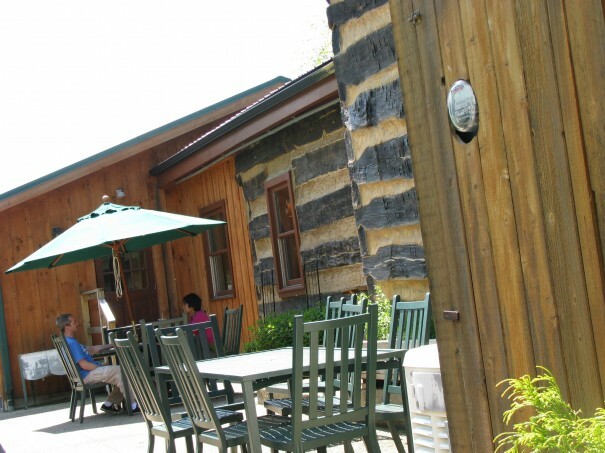 The log cabin dining room is cosy and rustic and the patio is sheltered and surrounded by flowers. A lovely spot to refuel after a hike. The Inn offers seasonal cooking classes, wine tastings and even a wine and beer festival. Coming up next is a dessert class on August 2nd. The Inn at Cedar Falls is a member of Dine Originals Columbus and offers reduced price accommodation gift certificates in the quarterly gift certificate releases. Look out for their next gift certificate release coming up on July 12th. The Inn at Cedar Falls will offer a $100 gift certificate for $70 towards lodging. Really enjoyed the alternative eats tour last night! You did a fantastic job, and I will be telling all my friends about your food adventures tour. Saw your post on the Inn at Cedar Falls. I have stayed there a couple of times- once in a cabin and another time in a cottage, and I absolutely love that place. I wish you the best, and hope your food adventures continues to be a success. I will definitely sign up for additional food adventures in the future. Thanks Kevin – glad you enjoyed the tour. We’d love to see you again on another one.